Hope this little Printable card brings Joy to you and to all you give it to! Congrat's on over 700 followers and 100 posts! 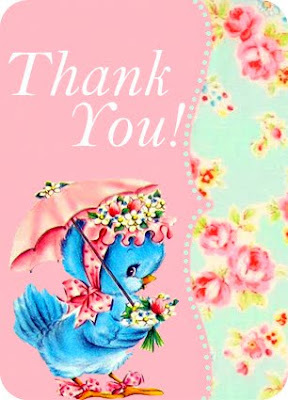 Thank you for all the lovely images that you so generously share! LOVE it! Thank you so much for sharing your talents! Oh my goodness! I don't know if I can handle all of the prettiness! Thanks for such lovely images. You are such a doll baby!! Thoughtful as well as pretty! These are DARLING!! Thank you!! Keren I love it! Congrats on 700+ followers. I'm so proud of you :) Love ya! What a beautiful card! Thank you! Have a wonderful day! That is SO cute! Thanks so much for sharing, I'll be linking. And big, huge congratulations on the followers! 700 followers!!! Wow you have tons of friends!! Congratulations!! Thank you for the sweet Thank you card graphic too- I write tons of thank you cards for our ministry and these would be fun to send out! So so cute. I am just in love with everything you do. You are quite talented and so kind for sharing your gifts! You have such a giving heart! Be blessed dear one. What a beautiful post…not just "Pretty"…"BEAUTIFUL" love your wise words, all wrapped up in a little vintage treasure…so blessed to have found you…will wonder through your charming world tomorrow. thank YOU for sharing all these beauties! What a pretty card! 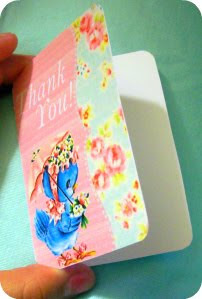 I just love sending thank you cards. I think people need to keep sending hand written cards more! Love the blue birdy! Thanks!